Doctors have recently discovered that Kev has an extra brain hidden underneath his cowboy hat, and it is there that he keeps the words for all the Country songs that he knows. As well as singing, Kev plays a Godin electro-acoustic guitar - like Shania Twain, it was made in Canada. Dave once toured the continent in an Abba tribute band, but he has put away the white knee-length boots and satin mini-skirt to play Country. If you are ever having trouble sleeping, ask Dave what all the knobs and switches on his guitar are for. Graeme was front-man and guitarist with Country trio Diamonds & Dirt before throwing in his lot with the Crow Valley Band. He still finds time to play guitar and bass as a 'dep' with other bands. 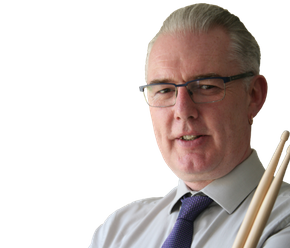 Glenn is a professional drummer and drum teacher, with years of UK and overseas touring experience When not out with Crow Valley Band, he can be found behind the kit with Wild. "Thank you for a wonderful evening of entertainment at our festival. A really good night of good country music."